Justin Martyr (100-165 AD), also known as Saint Justin, was an early Christian from Nablus on the West Bank, who was martyred in Rome. He is known for his writings defending Christianity. ↑ Lebreton, J. (1910). 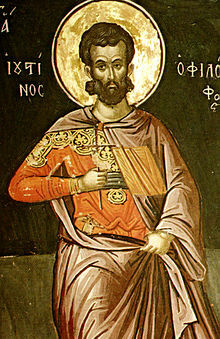 "Catholic Encyclopedia: St. Justin Martyr". newadvent.org. Retrieved 29 March 2013. This page was last changed on 15 December 2014, at 07:25.